Cats typically want to urinate in their litter boxes! Naturally, a cat wants to bury its excrement so that predators cannot find it (or them!). It's instinctual and it makes the cat feel safe. Medical Concerns: Consider These First! The first issue to consider if a cat has begun to urinate inappropriately and/or on the bed, is the possibility of illness or injury. Cats usually want to use their litter boxes and feel most comfortable using them, so it is not a good sign if a cat stops using theirs. A complete check-up with a veterinarian is the best first step. Oftentimes a cat with a urinary tract infection (UTI) or kidney infection will urinate while sleeping, and our beds are a common place for cats to sleep. Elderly cats may have difficulty getting in and out of the litter box, and may need some adjustments to help with this. Medical issues can be complicated, so it is best to check for these first in order to be sure that the problem is not a physical one. 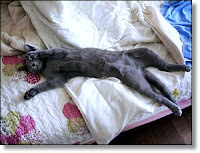 To read more on this story, click here: Why Does My Cat Pee on My Bed?